libvirt supports creating virtual machines running in UEFI mode and uses iPXE to enable network booting. When MAAS gives shimx64.efi, as it does on all UEFI systems, to iPXE it chainloads grub but fails to the grub prompt. If I modify MAAS to give grubx64.efi instead of shimx64.efi UEFI booting works. Ideally iPXE would be modified to properly chainload the shim however MAAS could also check the user-agent when returning the boot file as follows. Optimally, also do the MAAS thing. I switched the ipxe-qemu packages to build in qemu mode, which makes things use OVMF's internal network stack (so things might work differently with some bootloaders or something when netbooting). It might do other stuff, too, I don't really know. That said, the configuration is specifically for qemu, and used by other distributions, so this aligns us more closely with them, reducing chances of breaking stuff. When I configure the machine to network boot iPXE is used to try to boot the machine via TFTP. 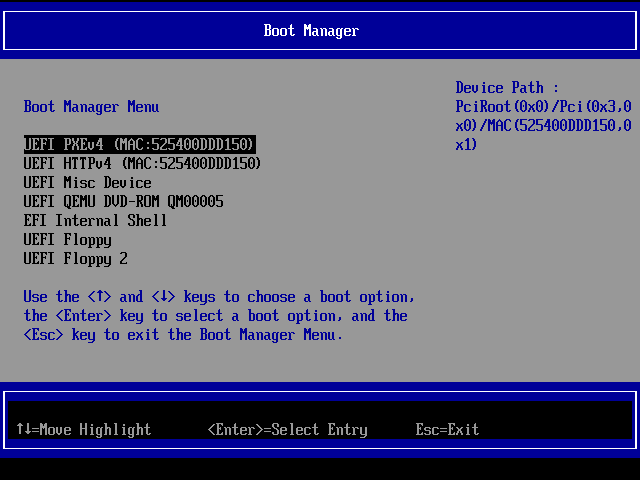 If I go into the UEFI firmware on the virtual machine I can see there are two options to network boot. The first is PXEv4, the second is HTTPv4. It doesn't seem that booting HTTPv4 uses iPXE however that method is not currently supported by MAAS. So, what is the failure mode here? Just not finding the binaries? Sorry forgot to include the failure screenshot. I can reproduce. This looks to be something in grub that shim doesn't appear to like. datasize: ? SumOfBytesHashed: ? SecDir->Size: ? Something is wrong here. These '?' are the result of a printf %u format string... that shouldn't happen. Not having right output makes it difficult to further debug and confirm whether this is a problem with shim or the uefi network driver or the grub binary or the tftp server. If anything, TBH it's unlikely to be shim /or/ grub; seeing as netbooting on hardware just works; but we should have a good look at shim and grub anyway. One thing to add, this happens *before* any GRUB configuration is loaded. The machine requests an address over DHCP, bootx64.efi(the shim) over TFTP, and then grubx64.efi over TFTP. Nothing else is requested. and manually booting shim from the iPXE commandline which then tries to chainload grubx64.efi. With systemd-boot instead of grub, it simply fails, pretendign the file does not exist. sudo kvm -bios /usr/share/OVMF/OVMF_CODE.fd -device virtio-net,netdev=n1 -netdev user,id=n1,tftp=/boot/efi/EFI/ubuntu,bootfile=shimx64.efi -global virtio-net-pci.romfile=""
if I remove the last option (which disables iPXE), it fails to boot again. Building iPXE with CONFIG=qemu seems to be a fairly complicated affair. The build system is a mess. Thanks Laszlo, ipxe built with CONFIG=qemu successfully makes shim load grub. Isn't that just a workaround? There is still an underlying bug in the iPXE network driver isn't there? Yes, I think there's a bug in the iPXE network driver, but now it only applies to bare-metal users essentially. If that is a problem to anyone in practice, I'd suggest opening a new bug for that (or directly going upstream, maybe); so we can use this one to track the fix for MAAS VM stuff. Isn't iPXE what implements TFTP PXE boot? When I tried Julian's command kvm tries UEFI HTTP boot which isn't currently implemented in MAAS and is blocked by lack of grub support(LP:1787630). (3) only works on virtio, (1, 2) also work on other cards supported by qemu. Accepted ipxe into bionic-proposed. The package will build now and be available at https://launchpad.net/ubuntu/+source/ipxe/1.0.0+git-20180124.fbe8c52d-0ubuntu2.1 in a few hours, and then in the -proposed repository. Verified that -ubuntu2 fails and -ubuntu2.1 from proposed works by running the command specified in the test case in a bionic system. I've verified that the updated ipxe package fixes virsh UEFI deployments wtih MAAS. I tested commissioning, and deploying both Ubuntu 18.04 and CentOS 7. The verification of the Stable Release Update for ipxe has completed successfully and the package has now been released to -updates. Subsequently, the Ubuntu Stable Release Updates Team is being unsubscribed and will not receive messages about this bug report. In the event that you encounter a regression using the package from -updates please report a new bug using ubuntu-bug and tag the bug report regression-update so we can easily find any regressions.